Helps children develop a sense of rhythm within music, let your kids participate in creative musical movements and enjoy fun at an early age. A great gift and musical instrument for your children's preschool education, develop your kids' capacity of thinking and imagination. Non-toxic, safe and lightweight,easy for your little love to shake. Perfect for wearing on ankles or wrists, gently shake the bells, it will make beautiful sound, baby will be interested in it. Recommend kids over 6 months to use. Package Includes: 10PCS rainbow color wrist band bells with 2PCS handle wooden bells, send by random colors. 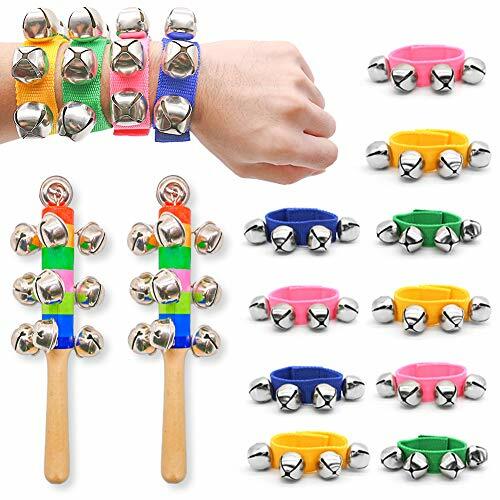 Good Quality: these wrist band bells consist of premium nylon wrist and metal bell, each wrist band has 4 bells. With handmade wooden handle, each handle bell has 10 small cute bells. Easy to Use: each wrist band bell has adjustable strap, which fits for all the babies or children. Smooth handle surface is more suitable for children to hold. Fun for Babies: bright color and wonderful sound can capture baby's attention, bring them more fun, engage children in the joys of music. Wonderful Musical Rhythm Toys: perfect for preschool education,neighborhood party,birthday party and more.